As a mom, keeping your baby close and safe is of utmost importance. Thankfully, there are products like the HALO Bassinest to help you do just that. The HALO Bassinest Swivel Sleeper is the only bassinet that swivels to bring baby to you for close, safe sleep. Courtney from Viva Veltoro recently had the chance to review the HALO Bassinest and a HALO SleepSack Swaddle with her new baby girl. Be sure to check out her review to see all of the amazing features of the Bassinest in action! We’re excited to partner with HALO to bring you a fabulous giveaway for their newest products! 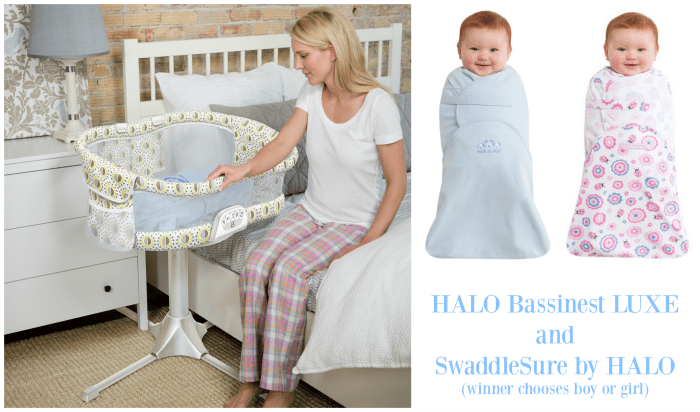 One person is going to win a HALO Bassinest Swivel Sleeper LUXE and SwaddleSure! HALO Innovations is excited to announce a new arrival to its family of safe sleep products – the HALO Bassinest Swivel Sleeper LUXE. Available in Lemondrop print with a white base, the HALO Bassinest LUXE Series includes a soothing center with night light, 3 lullabies, 3 soothing sounds, 2 levels of vibration, a nursing timer and a coordinating storage caddy that provides additional space to keep baby’s essentials right at your fingertips. It also features a new floor light to help you see without disturbing your baby or your partner – ideal for helping you see the floor when getting in and out of bed. SwaddleSure is HALO’s latest Swaddle product, featuring a three-point fastening system that resists “breakouts” for superior, more secure swaddling. Its generously-sized leg pouch helps baby’s hips stay in the correct, frog-like position, which ensures healthy hip development and allows easy access to baby’s diaper for diaper changes. Open to the US and Canada ages 18 and up. Ends 2/10/16 at 11:59 PM EST. 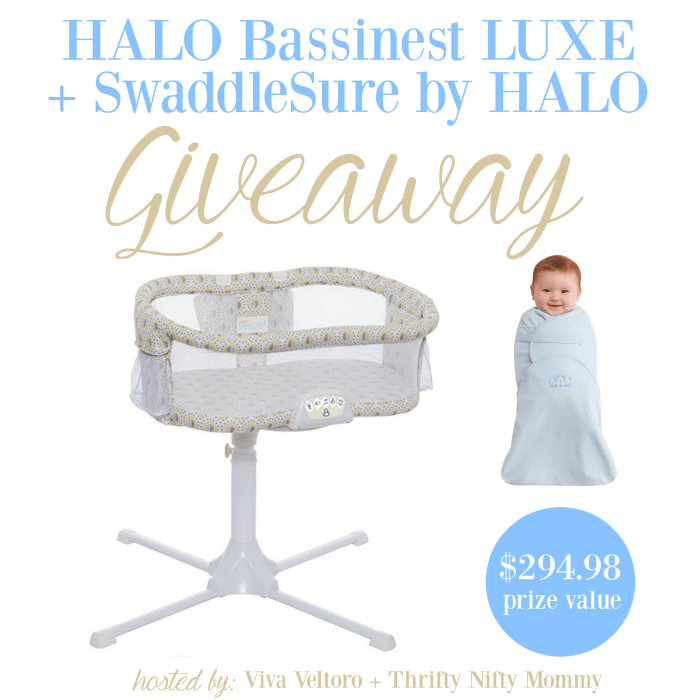 Enter to win a HALO Bassinest Swivel Sleeper LUXE and SwaddleSure using the form below. Disclosure: Courtney from Viva Veltoro received this item at no cost to facilitate this review. All opinions are her own. One winner will be randomly selected using the Giveaway Tools random selector and notified via email. Once notified, the winner will have 48 hours to respond or a new winner will be chosen. This giveaway is in no way associated with Facebook, Twitter, Instagram, Pinterest or Google. Void where prohibited. Prize fulfillment is the responsibility of HALO Innovations. I would love to win this for a friend at work who is expecting her 1st baby.